In the order of importance: cut, colour, clarity and carat (the four Cs). The Cut grade refers to a diamond's ability to return light (sparkle). Even with exceptional colour and clarity when a diamond is poorly cut, it will look dull. When choosing a diamond the cut needs to be considered as important as clarity and colour. The diamond's cut determines its fire and brilliance. The cut grade is established by defining the relationship between a diamond's light performance, dimensions, and finish. If a diamond is cut too shallow, light escapes out the back of the diamond and its fire and brilliance is diminished. These qualities of cut allow the minimum of light to be lost. The majority of light that enters the table (flat top of the stone) is being reflected back though the table. Enabling the stone to show its best fire and brilliance. If a diamond is cut too deep, light will escape out the side and as with the shallow cut fire and brilliance is lost. Light Performance; the overall appearance of a diamond when it is viewed from the top. The description factors in the brightness, fire and scintillation of the diamond in both fixed and tilted positions. In order to cut a good, very good, or ideal stone the diamond cutter needs to have a high level of skill and experience. The higher grades of cut also take longer to achieve. Therefor diamonds with the highest cut grades cost more. The presence or absence of colour is the basis for grading in diamonds. With traditional white Diamonds the less colour visible in the actual stone material the better the grade (how white is the diamond). The whiter the stone the more of a rainbow flash will be seen, showing a more colourful fire. A diamond with a gadding of D, E, or F is regarded as colourless. A colour grade of D is the highest possible, while Z is the lowest. Colour shows itself in a diamond as a pale yellow. This yellow is not strong enough in tone to be considered a coloured stone and has a dulling effect on the stone (in coloured diamonds the intensity of colour enhances the diamond). Because of this a white diamond's colour grade is based on its lack of colour. The less colour a diamond has, the higher its colour grade. After cut, colour is generally considered the second most important characteristic when selecting a diamond. This is because the human eye tends to detect a diamond's sparkle (light performance) first, and colour second. 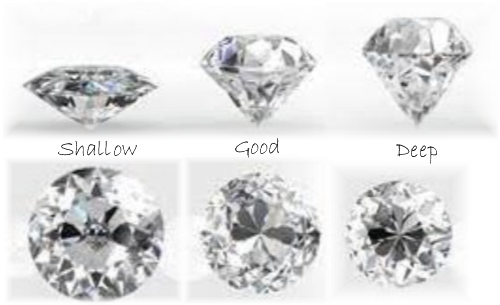 The visible difference between diamonds of one colour grade, for example G to H or I to J, is so minor it is difficult to detect with the unaided eye. The difference in price however, can be significant. Clarity is a measure of the number and size of the tiny imperfections that occur in almost all diamonds. Flawless clarity diamonds are rare and expensive. A diamond with flaws that can’t be seen by the naked eye, (referred to as eye-clean) can be good value. The beauty that is seen by the naked eye when viewing the eye-clean diamond is usually not affected by these imperfections because they are microscopic. Much is made of a diamond's clarity, however many experts agree it has the least impact, in terms of the 4Cs on a diamond's appearance. These imperfections are referred to in technical terms as blemishes and inclusions. Diamonds with the least and smallest imperfections receive the highest clarity grades. Carat is a measurement of weight and not size. Therefore two diamonds of the same carat weight but differently cut, when viewed from the top, may or may not appear to be the same size. Every carat is divided into 100 points (just as there are 100 cents to the dollar). However, stones jump up dramatically in value (price per-carat) as they increase in size. There are a number of thresholds in the per-carat price of diamonds. They are caused by the fact that the rough (the uncut crystal) for the heavier diamond is rarer than the rough for smaller stone. As the diamond weight increases the price per-carat rises exponentially. Also to be taken in to account is the clarity and colour. The better quality stones are also rarer. There are weight thresholds where the price per carat jumps. A 90-point stone may be more than 10% cheaper than a 1 carat stone because of a price threshold. The one carat stone being more popular creates a price threshold. It is the demand for the one carat stone that creates this particular price threshold not the availability of the two different stone weights. The difference in the look of the size of the two stones may be difficult to see when viewed from above. Generally, it can take around about a 20% increase in carat weight for the size difference to be obvious. Because of these price thresholds a 1 carat stone will be more than double the price of a half-carat stone (which is also called 50points). A 1 carat stone is a lot more valuable than one hundred one point stones. Two common diamond threshold price jumps are at the full-carat and half-carat marks. To get the best value, look for diamonds just below these sizes, for example purchase a .97-carat diamond instead of a one-carat. Visually, you will not be able to see a difference in size, but your savings may be significant. Many shops advertise a ring having a total of one carat of diamonds made up of smaller stones. There is nothing wrong with this as long as it is understood that the small stones adding up to a carat are not as valuable as a single one carat stone. Fluorescence is the reaction of trace minerals within the diamond that cause the diamond to glow when exposed to ultraviolet light. Ultraviolet light is the light that is often used in night clubs to give the effect of making white things glow. Sunlight contains ultraviolet light (as well as other light wavelengths) so diamonds with fluorescence will react to daylight. About one third of all diamonds fluoresce. More than 95% of those that do fluoresce will fluoresce blue. The next most common color is yellow. Fluorescence grading is: None, Negligible, Faint, Medium, Strong, Very strong. Diamond valuers agree that fluorescence that is yellow has a negative impact on the look of a diamond, and it value. However the impact of blue fluorescence on diamonds is debatable. It has been commonly believed, that diamonds with colorless grades (D-E-F) or near colorless grades (G-H-I-J) appearance is negatively affected by fluorescence lowering their value. However the faint yellow grades (K-L-M) tend to be higher in price when exhibiting fluorescence, the blue in the fluorescence improving the perceived colour of the diamond and counteracting some of the yellow. Sometimes when a diamond has very strong fluorescence, the diamond will have an oily look to it, even in normal lighting conditions or appear hazy or milky. When this happens, it has a negative impact on the value. GIA studies show that for the overwhelming majority of diamonds, the strength of fluorescence has no widely noticeable effect on appearance. It was also found that the average person could not make a distinction between a diamond with fluorescence and a diamond without. Since this study some industry experts no longer consider fluorescence of much importance and see no reason for it to affect the pricing of a diamond (unless it is obviously effecting the look of the stone). If buying a diamond as an investment stone, fluorescence needs to be taken into account. A stone with a grading of 'None' would be recommended. If buying a diamond for its beauty, pleasure or love the effect of the fluorescence on the individual diamond (negative or positive) needs to be taken into account. The preference to buy a diamond that exhibits fluorescence is a personal one. 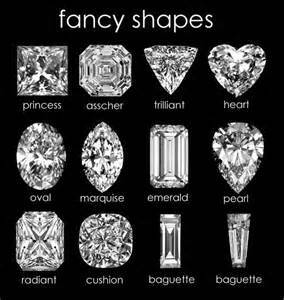 Summary:, cut, clarity, colour and carat are the four main influences on a diamonds quality and price. It is good to know about fluorescence, what it means and how it may affect the diamond being considered.